What? You want to know what scared me about this book? I think the better question is what DIDN'T scare me about this book! Oh, the book starts out peacefully enough. The king's bored. He wants some new, interesting weather. Enter the first scary thing about this book: the king's magicians. Tell me they're not creepy, marching around their cauldron in the bowels of some creepy dungeon place. And then there's the oobleck itself! I understand that the king didn't mean to do so much harm, but it's so green! And sticky! And it starts off tiny and then grows and grows and GROWS. And pretty soon everyone's all stuck to everything else and no one can move. I'm feeling suffocated just thinking about it! Now that I think about it, it reminds me of the purple smooze from the My Little Pony Movie. What do you think? The other book I want to talk about today is a little harder to explain. When I read it as a kid, the most distinct memory I have is a vague sense of unease, but when I picked it up to reread it, I couldn't pinpoint exactly what had made me so nervous about it. There's a Wocket in My Pocket. In Wocket, a boy goes about his house describing the fantastical, rhyming creatures that happen to live there. There's a Wocket in his pocket, a Gheir under his chair, etc. etc. Now that I've reread it, I realize that many of the creatures are friendly! He enjoys the company of some of them. But I guess it's the other creatures that preoccupied me as a kid. I mean, imagine if your house was filled with various imaginary creatures. Just... watching you. It's a little creepy, you have to admit. 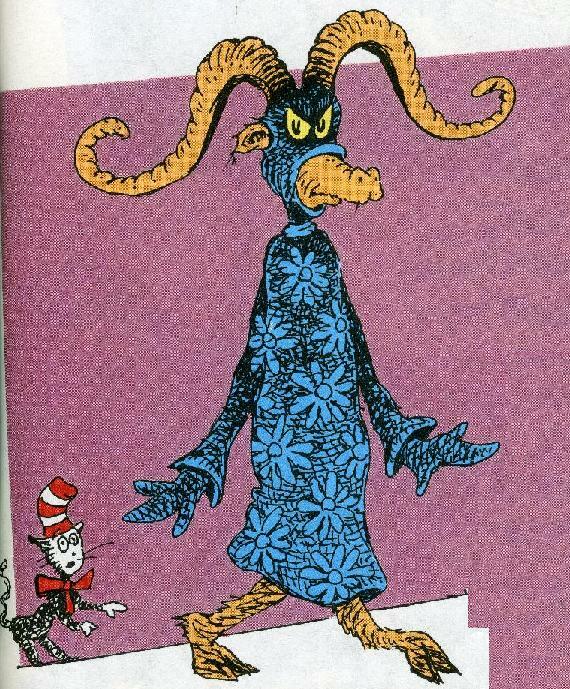 And there you have the Dr. Seuss books that scared me as a kid. We don't have any Dr. Seuss books left on our shelves! The book that scared me was The Sneetches and Other Stories. I wasn't afraid of the Sneetches, but the last story in the book terrified me. Appropriately titled "What Was I Scared Of?" the story features a pair of personless pants and lots of dark scenery. It still gives me the creeps when I see it! The oobleck makes me think of the blob. Great twist on Seuss birthday theme. Haha, I like this post. At my preschool, we don't do Dr. Seuss very often, if for no other reason than the kids just don't have the attention span for it and it is more appropriate (in my opinion) for kindergarten up. My kids can barely sit through The Foot Book before they are itching to get up. I will read The Foot Book, Ten Apples Up on Top, and Hop on Pop. I don't remember any Seuss books particularly scaring me (unless you count The Grinch who was totally scary looking and just evil) but I do remember some of them getting on my nerves. I didn't like The Lorax or Mr. Brown Can Moo, Can You? I remember thinking Mr. Brown was kind of lame, haha. My favorite Seuss book of all time has to be Oh, the Places You'll Go!, which, like everyone, I got for college graduation. And I loved it and still do. Oh, I forgot. I will also read my students Red Fish, Blue Fish and if they are a particularly attentive group, I will read Green Eggs and Ham toward the end of the year. What a unique way to celebrate the day. Kudos Abby! The book that bothered me - and sort of scared me was the Lorax. It wasn't the environmental piece, but I remember seeing it on TV and feeling intimidated by it. Not a book, but the movie The 5000 fingers of Dr. T was very creepy! My mom, who is a music teacher, loves it and I find it scary!! Rebecca, I totally agree that Dr. Seuss works better for the K+ crowd! Yet we still have a bunch of preschools wanting us to come and do Dr. Seuss programs. We stick to the shorter books and try to get creative with props and things to make it work. I love Dr. Seuss! My 5 year olds really got into Yertle the Turtle when I read it and they really seem to like Suess so I have been trying to make it a very Suessfilled week! I totally loved Bartholomew and the Oobleck! I am sad that it scared you. I don't think I was scared by any of his books, but I was terrified by the Grinch Night cartoon. Ohmygoodness, I never really thought about it, but the oobleck is SO the My Little Pony smooze! Oddly enough, I don't ever remember being scared by a Dr. Seuss book. But reading your post, I'm thinking I should have been. I'm with Friend of the Farm. Those Pale Green Pants With Nobody Inside 'Em are terrifying to little kids in a totally satisfying way. I remember being scared but fascinated by them. Now I love reading it -- making sure the kids are old enough. I think I was scared of Oobleck, too, but also in a rather fascinated way. My son is TERRIFIED of a character named Foo Foo the Snoo from "I Can Read with My Eyes Shut" (I think... so many of his books have blended together in my mind that I can't keep track of what's in which). My son 2 1/2 is a huge fan of Mr. Brown Can Moo and Red Fish Blue Fish. Green Eggs and Ham is a little to long. I loved If I Ran The Circus and If I Ran The Zoo. Those really encourage imagination! I don't remember being scared by that many Dr. Seuss books but I never had a chance to read all of the ones you have posted here. Maybe I need to check them out. I loved Bartholomew and the Oobleck so much when I was little. I checked it out of the public library repeatedly. Finally my mom cut me off so that some other kid would have the chance to read it. I loved Bartholomew and the Oobleck, but more because it was scary than in spite of. I found the beginning of The Lorax very scary, with the whatsit in the boarded-up building, but again, I kind of liked it, too. And I did a grades 6-9 Dr. Seuss program last year, and they loved it except when their darn teachers made them read aloud (and none of them were confident readers). I didn't like Dr. Seuss books because I thought that I was supposed to know what all of his made up words meant. So, I wasn't afraid of his books, I was afraid of how smart I wasn't. I need to identify other books, besides Seuss', that use nonsense and made-up words. The only one I have been able to think of is Baloney by Jon Scieska and Lane Smith. Any suggestions? By the way, the story that scared my son the most was "What was I Scared Of?" in The Sneetches and Other Stories.